Never underestimate the creativity and resourcefulness of a young man in love — nor the power of a progressive company dedicated to providing the ultimate customer experience. It all started when smitten boyfriend Adam wanted to deliver an epic marriage proposal to his girlfriend of five years, Taryn. Adam had produced a cleverly edited four-minute proposal video for Taryn and wanted her to see it during their flight from San Francisco to Long Beach, Calif., where they planned to celebrate his birthday. Ambitious Adam contacted JetBlue Airways about the prospect of delivering his proposal at 30,000 feet, and the rest of the story is pure magic, as no fewer than eight JetBlue departments collaborated to make this a perfect day for the couple. This past Wednesday, exactly 28 minutes into the 90-minute JetBlue Flight 1437, Adam’s video began to play simultaneously on the monitors of each of the plane's 150 passengers. In the video, Adam details how he first met Taryn when she was a hostess at a P.F. Chang's restaurant and he was a server there. Illustrated with a montage of pictures from their five years together, the video recounts how Adam won Taryn’s heart after a shaky start and lists all the qualities he loves about her. Then these words appear: "You are the girl I think about. You are the girl I dream about. You are the girl I can't be without." Then the big question follows: "Will you marry me?" After the video went black, Adam got down on one knee and proposed to the visibly overwhelmed and emotional Taryn. She said, “Yes,” and excitedly slid her new ring onto her finger. 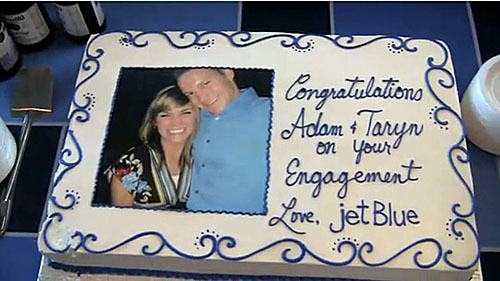 The couple embraced and the JetBlue captain made an announcement to the other travelers that Adam and Taryn were officially engaged. But the excitement didn’t end there. 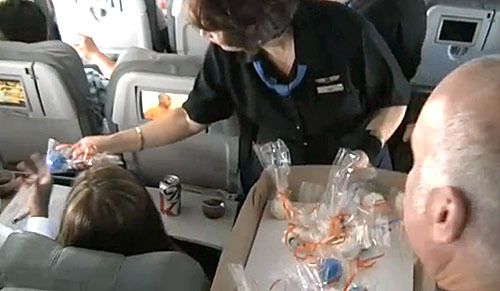 The JetBlue in-flight crew continued the celebration by handing out cake pops to all the passengers. When the couple entered the Long Beach terminal, they were applauded by dozens of enthusiastic orange-vested JetBlue staffers. The airline also surprised the couple with festive decorations, a huge custom cake bearing their likenesses and, of course, some champagne.